“Cuba, yes, blockade, no!” Cuban diplomats chanted during the United States-organized forum held at the UN headquarters in New York highlighting the nearly six decades old economic and cultural blockade against the island nation, which President Donald Trump has intensified since entering office in January 2017. 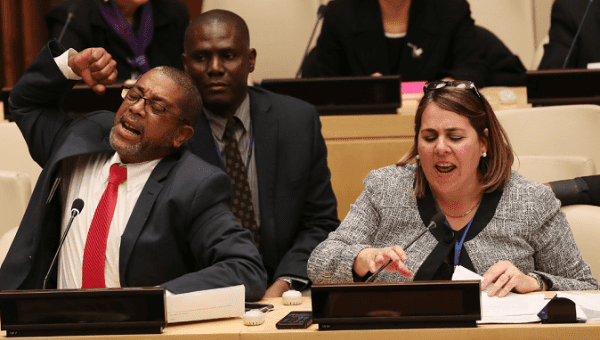 Among those who interrupted the U.S. envoy to ECOSOC, Kelley Currie, during her speech that launched the “Jailed for What?” campaign, was the nation’s ambassador to the UN, Anayansi Rodriguez. After the UN meeting Rodriguez pointed out the hypocrisy of the U.S. initiative set up to accuse Cuba of human rights violations: “The imprisonment of children would have rightly justified the name ‘Jailed for What?’ ”, Rodriguez said referring to the U.S. policy of separating and detaining Central American children and parents at its southern border trying to gain entry into the United States. “This is a shame for the United States government,” she added. Currie told reporters after the incident that the Cubans demonstrated “thuggish behavior” that has “no place” in the United Nations. In support of Cuba, Bolivian President Evo Morales tweeted that the blockade had cost the island US$130 billion, a figure published by the United Nations in May. “The Ministry of Foreign Affairs of the Republic of Cuba strongly rejects the defamatory campaign against Cuba on human rights launched on 16 October by the United States Government at United Nations Headquarters. “As has already been pointed out, this action is part of the sequence of statements against our country carried out during recent weeks by high-level officials of the United States government, who show increasing hostility towards Cuba and the Cuban Revolution,” the statement said. Cuban officials said the U.S. should reverse its systemic gender and racial discrimination that exists within the country. “The United States government should account for the 987 people killed in 2017 by law enforcement agents by firearms. African American people, who make up 13% of the population, accounted for almost 23% of the victims. “There is systematic racial discrimination in law enforcement and in judicial bodies. Black male offenders were sentenced, on average, to only 19.1% longer than those white offenders who were in similar situations,” Minrex said. ECOSOC is responsible for coordinating the economic, social and related work of 15 U.N. specialized agencies, their commissions, and five regional commissioners.